We live in a time of movement that hasn’t been seen since the 1960’s. A Civil Rights movement, political uncertainty, a war on terrorism and ultimately a point in American history where the rights of the individual have not been publicly exerted since the establishment of those rights. We are experiencing a paradox of liberty and safety that seems to only be seen in its extremes, creating a new challenge for the beliefs of Americans. Most recently, Colin Kaepernick’s subjective act of sitting during the national anthem has brought up the conversation of these rights. The initial response was complete anger at Kaepernick for what most considered to be unpatriotic. Millions have died for the flag that he can’t stand for, but the right that he is exerting has been secured by the deaths of those same millions. Without those rights, what sort of society would the United States be? Especially without the ability to question the acts and movements of the country? Defending his actions, Kaepernick stated “I am not going to stand up to show pride in a flag for a country that oppresses black people and people of color.” Kaepernick is right, there is definitely an issue with equality amongst races in the United States, the reason for his actions is justifiable. According to the Center for American Progress, “One in three male African Americans will be imprisoned, while African Americans have also received significantly longer sentences than whites being imprisoned.” Statistics like these contribute to the distinctive distrust of policemen and the other bureaucracies of the government that are entitled to protect the God given rights of citizens. We are living in a time of police brutality similar to the magnitude of that after the Rodney King beating, with the killings of Trayvon Martin, Michael Brown, and recently Philando Castille. 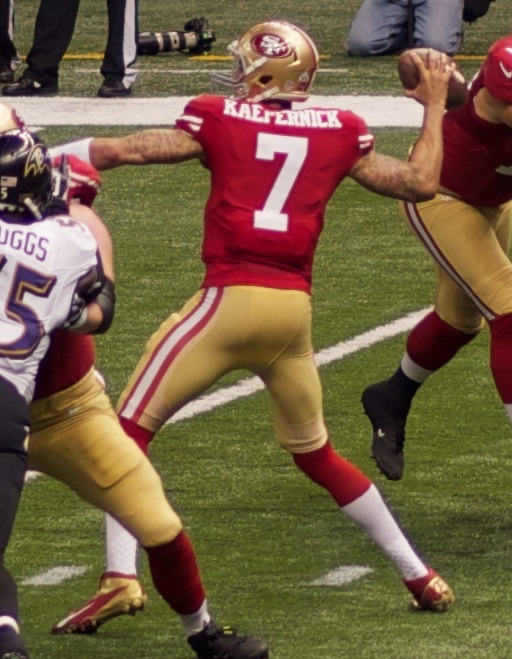 In an attempt to draw attention to the ongoing inequality, Kaepernick also disrespected those who protect his right to express his dissatisfaction with his country. As we are reminded by the 15th anniversary of 9/11, the meaning of that flag and the anthem still needs to be valued. Sitting during the anthem disrespects all those who died in those towers, the firefighters, the police officers, the citizens, and the troops that reacted to those horrible acts. To sit down is to devalue the sacrifice of all those that not only allow Kaepernick to play football for a game, but also protect his freedom to choose to sit during the anthem. The Constitution binds all citizens to the law of the constitution; it’s the supreme law of the land. It is the one contract that all Americans’ are bound to. The rights granted in the Constitution secure the safety of the Union in which the United States must withhold. The flag represents even more than the Constitution represents. It represents a country of opportunity. It honors the millions that have came before us to make sure that we don’t see another Pearl Harbor or another 9/11. Sitting down during the national anthem, to me, is a dishonor to those people. There’s a right to freedom of speech and that right should by no means of the law be impeached; however, there is more respectful and honorable ways to exert that right then to sit down in front of those who allowed for you to be able to stand up.